JPB: Do fast bowlers repel crowds no matter how much they win games? Do fast bowlers repel crowds no matter how much they win games? Many people whom I talk to about this deny that spin bowlers attract crowds and fast bowlers repel them. Instead they argue that it is batsmen like Dennis Compton and Donald Bradman who attracted the crowds. The trouble with this argument, of course, is that cricket-playing nations had had unusually exciting and skilled batsmen before the really large crowds developed. Whilst this may reflect the fact the cricket had not become popular enough, it may also reflect the fact that fast bowlers inherently repel crowds. What in fast bowling repels crowds is not however clear: intimidation was largely absent from fast bowling between the end of the “shooter era” in the 1870s and the “Bodyline” tour of 1932/1933, whilst long run-ups and slow over-rates only began in the 1950s. Even the notion that it is the restricted range of strokes that causes weakness in fast bowling to correlate with big crowds so well seems doubtful when one sees how many runs fast bowlers of the 1900s and 1910s often conceded. It is possible that the predictability or stereotyped strokes used to hit these fast bowlers vis-à-vis strokes against spin that explains why the correlation is so robust. Many people who admit there may be truth is the notion that fast bowlers repel crowds more than they attract them (as figures almost unanimously suggest) feel that if the team with fast bowling is very strong (as is universally the case when pitches are fully covered) then fast bowling may still attract crowds. They often point to Lillee and Jeff Thomson in the middle 1970s as an example of this. 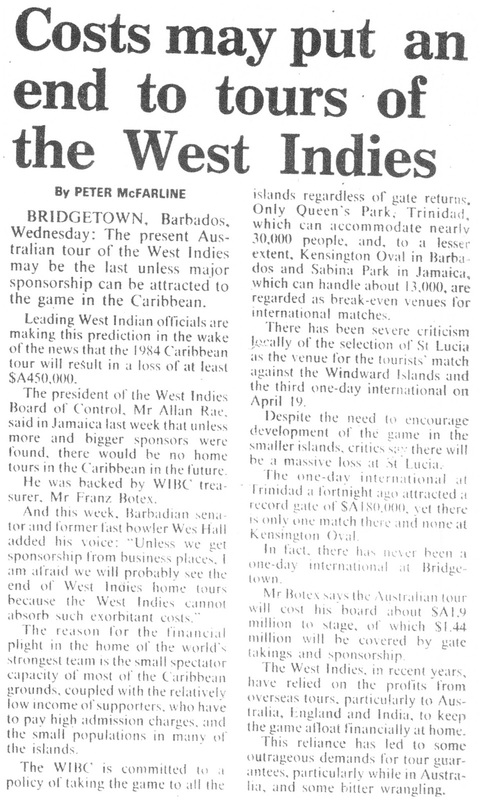 However, the article shown here from the Sydney Morning Herald during Australia’s 1984 tour of the West Indies severely questions the myth that fast bowlers attract crowds even in an era of “instant” cricket where the traditional spectator attraction of all-out attacking spin cannot be developed because it is much too expensive in “instant” forms of the sport. In 1984, with a battery of four fast bowlers (Marshall, Garner, Holding, plus Milton Small, Courtney Walsh, Winston Davis and Wayne Daniel) the West Indies were completely dominating Test cricket. Yet, Peter McFarlane clearly shows that even at the peak of their power Lloyd’s West Indians were losing a great deal of money playing home Test Matches. McFarlane attributed these losses to the fact that most grounds in the West Indies simply could not accommodate crowds of more than a few thousand, with the exception of Port-of-Spain and to a lesser extent Kingston and Bridgetown. He also said the low incomes of local supporters meant admission charges could rarely be paid. The question then is why the West Indies was not improving facilities to permit larger crowds at a lower price?? One might imagine British mass tourism would have provided a source of money, but McFarlane suggests English tourists did not produce the revenue it did in the 1990s when West Indians were losing interest in cricket in favour of basketball. McFarlane suggests the West Indies Cricket Board possessed more interest in taking the game to sub-marginal locations than to improve the most potentially profitable ones. 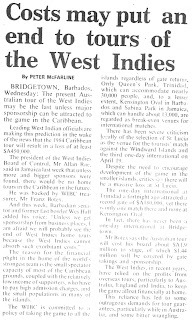 However, despite many other highly plausible reasons for poor crowds and low profitability of cricket in the 1980s Caribbean, that very same page (I did not copy it) of the Sydney Morning Herald actually shows the deliberate exclusion of spin bowling by policy and selection to have provided extremely boring cricket in Barbados. No specialist spin bowler had ever been played by the West Indies – being viewed as an expensive luxury with all the fast bowling available – since Gibbs’ retirement nine years beforehand. There is little doubt that the cleverness and variety of an all-out attacking spin bowler like a Mailey in Australia or Goddard, Doug Wright or Jack Walsh in 1946 and 1947 was uniquely entertaining to spectators – of course, most so when these bowlers were freely scored off when yet capable of getting them out with the very next ball. The evidence provided from (SMH description of) the play in Barbados certainly leaves the possibility highly open that if spin bowling is deliberately excluded either by policy or selection crowds will always stay away no matter how successful the policy become, giving to those who lament the commercialisation of the game by things like 20/20 cricket a clear answer.